I have a colleague who reminds me often, as I’m tearing my hair out over a particularly difficult diagnosis or agonizing about how to treat a critically ill patient, that animals are our teachers. As a veterinarian, this truth unfolds for me in different ways every day. Pet owners often find themselves in similar situations but under different circumstances. Most of us who have owned pets have been struck by their capacity to love us unconditionally. Everybody in the family thinks somebody else fed the dog. Instead of holding a grudge, the dog wags its tail appreciatively when someone finally fills the bowl. We leave for a weekend of skiing and put down a big bowl of kibble for the cat. We might expect it to withhold affection as punishment for a day or so when we return but instead find that it chooses to sleep right on top of our head that night, purring like a well-oiled motor. Denver attorney Doug Koktavy found himself with both of his beloved black Labrador retrievers diagnosed with terminal illnesses within a year of each other. Beezer and Boomer were littermates, inseparable companions and Koktavy’s best friends. Beezer’s diagnosis of kidney failure came first, followed shortly by Boomer’s of bone cancer. As a successful business owner, Koktavy was frequently challenged with situations that required him to use his intellect and work ethic to solve complex problems. His first reaction was to apply this familiar paradigm to Beezer’s disease. If Beezer had kidney disease, Koktavy would use all of his resources to beat it. When it became obvious that despite all of his efforts, his beloved companion was slipping away, Koktavy realized that the experience was meant to teach him there were things in life he could not control and there was power and peace in letting go. As a kidney failure patient, Beezer required daily fluid therapy, which Koktavy delivered faithfully every evening. Koktavy began keeping a journal detailing what he terms “conversations” with his canine companion that guided him toward learning how to say goodbye. He has now published those conversations in a book, “The Legacy of Beezer and Boomer: Lessons on Living and Dying from My Canine Brothers” in which he explores what he learned during those last days with his dogs. Koktavy’s goal in writing the book was to assist other pet owners who find themselves dealing with the grief brought on by the impending loss of a beloved companion. Denver, CO (PRWEB) October 19, 2010 A groundbreaking memoir that pet owners are hailing has just chalked up another first place book award. The prestigious Writers Digest Book Awards has named The Legacy of Beezer and Boomer: Lessons on Living and Dying from My Canine Brothers tops in the self-published Life Stories category. That brings the total awards it has earned in its first year of publication to ten. Author Doug Koktavy cites the universality of the book’s theme as the reason for its critical acclaim. “Although it’s just my story about my two dogs, I believe it is being recognized because of its help to pet owners everywhere. It is striking a chord with people who are going through what I went through when my dogs were dying. This is a really difficult emotional time for so many people, and my book provides some help with that. “Before The Legacy of Beezer and Boomer, there were no other books for people going through the emotions of fear, guilt, powerless and depression that so often occur before a beloved pet passes. I wrote about the strategies I learned from my dogs to deal with this anticipatory grief. A lot has been written about grief after a death, but so much more can be done to help your pet and yourself during the illness. Decisions need to be made, and life needs to go on, yet our emotions get in the way. We end up squandering these last few months or days by feeling bad when what we should be doing is just staying present and appreciating and loving our pets.” Conquering fear and guilt and learning to live in the present are just two of the lessons from the dogs. Doug’s story begins with a pronouncement from his veterinarian that Beezer has ninety days to live. Shocked and unable to come to grips with the knowledge that he suddenly is losing his best friend, Doug grows frantic with fear. His work and his own health begin to suffer as he chastises himself over what he might have neglected to do for his dog. What follows are some of the lowest lows and highest highs of his life as he says goodbye first to Beezer and then to his brother Boomer. Doug Koktavy is an attorney in Denver, as well as an author, publisher and speaker. He recently presented workshops on “Animal Teachers, Human Student” to the American Humane Association and the Argus Institute, at Colorado State University Veterinary Teaching Hospital. He also will be presenting a workshop on “The Need for a Presence Plan: Communication Challenges Associated with a Pet’s Terminal Diagnosis” to veterinarians at the Sixth International Conference on Communication in Veterinary Medicine in late October 2010. He is a Certified Counselor, Association for Pet Loss and Bereavement and a member of the Bone Cancer Dogs Yahoo Group. He is on the Board of Directors of Bone Cancer Dogs, Inc., a New Jersey nonprofit corporation. He also is a volunteer with Safe Harbor Labrador Retriever Rescue. He enjoys biking, running and taking quiet walks with his new black Lab, Dory. 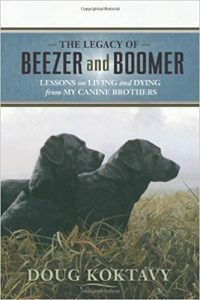 The Legacy of Beezer and Boomer: Lessons on Living and Dying from My Canine Brothers, published by B Brothers Press, 2010, is a 328-page hardcover book with illustrations by artist Chris Smith. Copies of The Legacy of Beezer and Boomer are available at http://www.BeezerAndBoomer.com and through Independent Publishers Group distributors.